Sterling silver and enamel 5 piece vanity set. English hallmarks for London 1932. 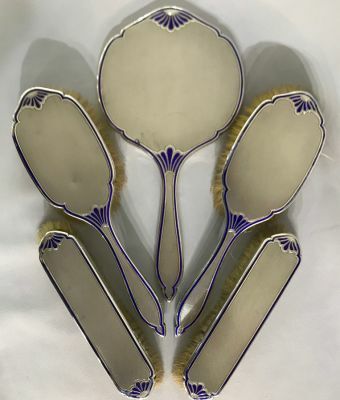 Made by William Comyns & Sons Ltd.
Comprised of a hand mirror, 2 hair brushes and 2 clothes brushes. There are minor losses to the enamel. The mirror is in good condition. The hand mirror is 9 3/8” by 4 5/8”.